Update: As I anticipated, my desktop had (and is still having) some troubles with the wireless. I’m currently able to connect to the Internet… but barely. I have an RaLink 2500 PCI card. For the previous version of Ubuntu (Gutsy) I was using the CVS version of this driver, because the one included in Gutsy was broken. This driver is being combined with a few other drivers and being rewritten as a unified driver, the rt2x00 driver. The good news is that this unified driver have been included in the kernel and they’re actively developed. The bad news is that (for me) they barely function. I tried using the windows driver through ndiswrapper, but that didn’t seem to work. I tried compiling the old CVS drivers again, and they don’t seem to work any more. So I’m back to the included driver in Hardy that limps along…. On the laptop side of things, everything went peachy… until I decided to try the binary NVIDIA drivers again (to play with 3D things). That was utter fail, and I remembered why I disabled them. But then.. my sound stopped working….? huh? 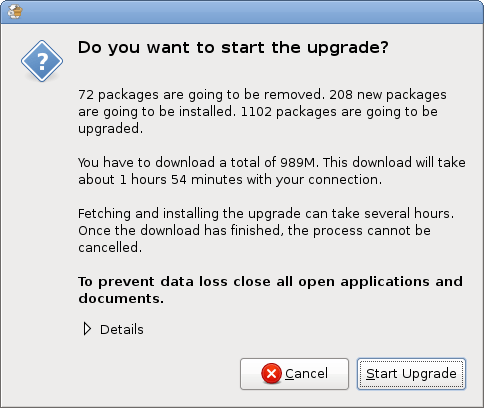 Temptation to do a fresh install rising. Update 2: I’m not going to hold my breath on my desktop’s connection, but it seems to be doing better. Also, I solved the sound problem on my laptop. And I set up my tablet. Whoo! Posted on Thursday, April 24th, 2008 at 5:30 pm. Tagged with: Hardy Heron, screenshots, Ubuntu. so…. I guess something didn’t go right? Yeah… it wasn’t catastrophic, but certainly not smooth, either. The wireless drivers that I *was* using prior to upgrade worked fine for me, but they are currently being rewritten. The new ones, which appear quite unstable, were included in the new kernel. I tried compiling the old drivers, but they don’t seem to work anymore, for whatever reason, so I’m trying something else with these new drivers, right now….